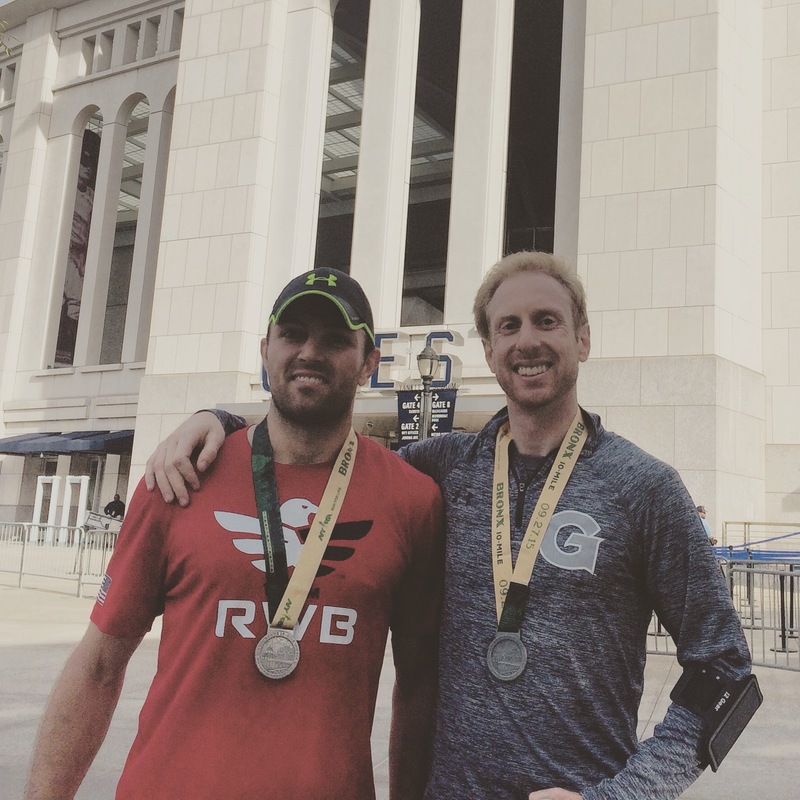 The recap before the recap: I ran the Bronx 10-Mile on Sunday and finished in 1:00:20, good enough for a 6:02 minute per mile pace and 76th place overall out of over 9,000 finishers. I could not have been more excited about my performance and the great time I had before, during, and after the race, and am so grateful for all the cool people I know who inspire me to work hard. Now for the full recap! True to my race preview, I ran two miles on Saturday morning, the first mile at about a 10:00/mile pace, and the second mile interspersed with 100 meter strides. I ate good food (plus half a chocolate shake with my girlfriend – gotta love Shake Shack), and got a full seven hours of sleep. I prepped my race gear and made a mental breakfast checklist that evening. So, when I woke up at 5:45 a.m., I felt refreshed and ready to go! That didn’t stop the nerves from creeping in, and I used the bathroom three times before heading out. I ate two slices of toast (one covered in peanut butter), a banana, and one cup of non-fat Greek yogurt with a teaspoon of honey. Stomach full and gear secure, I headed out at 6:20 a.m. I jogged 13 blocks to meet my sister and our friend Mike at Columbus Circle/59th Street, and we hopped on the D train to Yankee Stadium. The ride took about 15 minutes, and we talked to the conductor about the race (she was very interested in all the runners on the train). 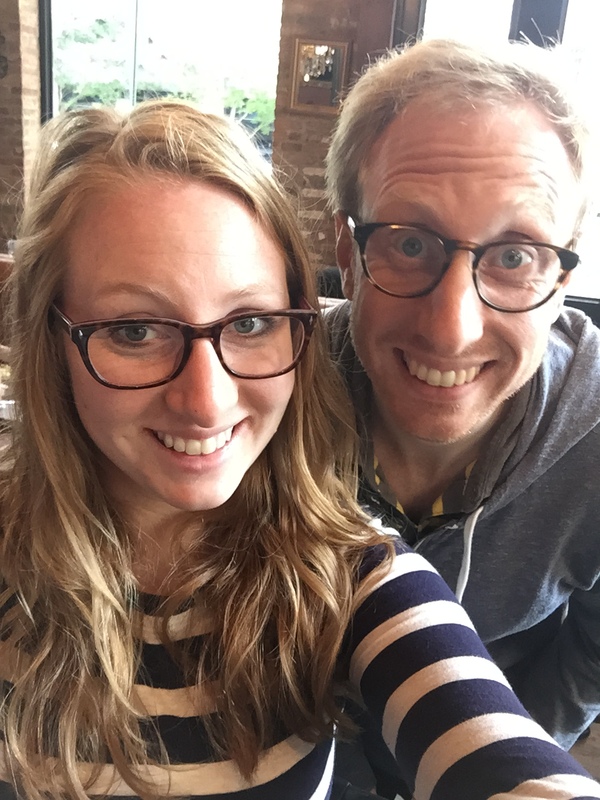 Mike and I grew up in the same town, so we filled each other in on what we and our mutual friends are up to. Pre-race photo 1: You all good? Once off the train at 161st Street, we checked our bags, hit the restrooms (again!) and met up with our November Project NYC buddies at 164th and Grand Concourse to take a team picture. 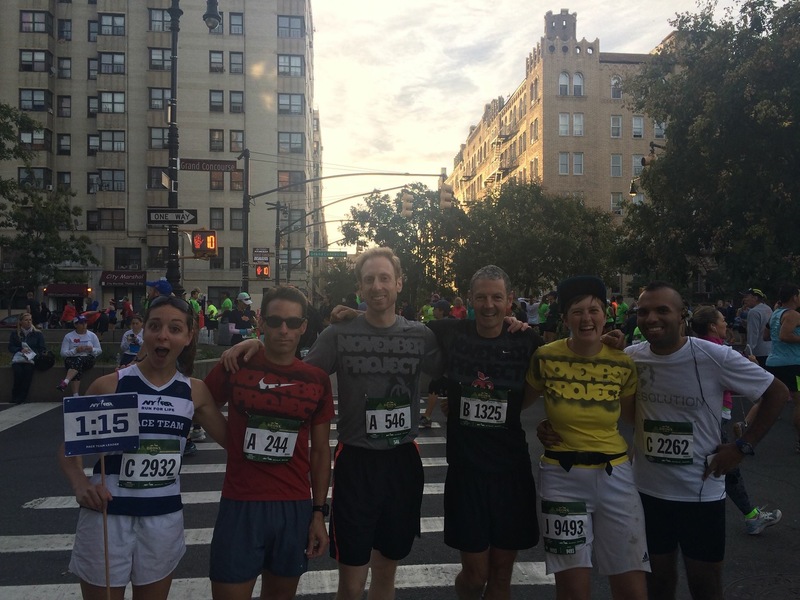 As usual, everyone from NP_NYC was cheerful and full of encouragement. We talked briefly about the course and the chilly air, and then split to warm up. 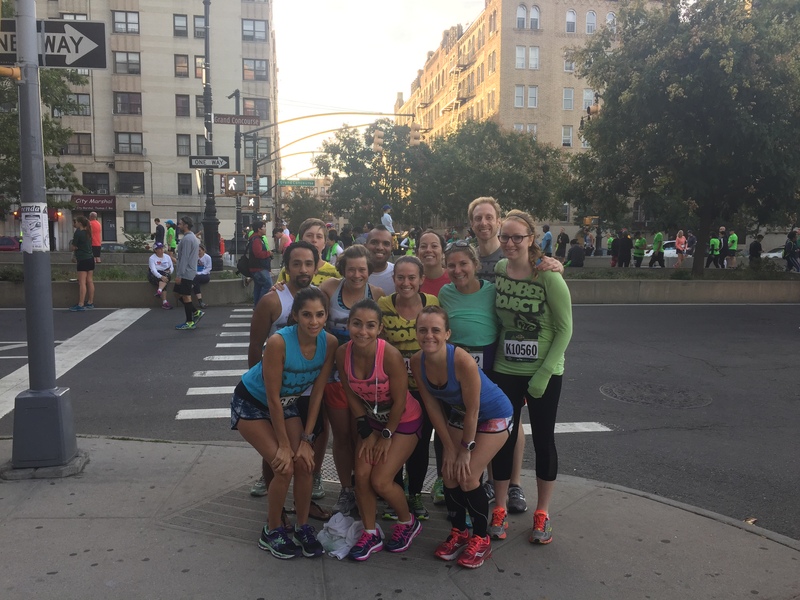 I ran a half mile, found another group of NP_NYC folks in the same spot as before, and took group photo 2! Pre-race photo 2: F*ck yeah! I headed up to my corral about 15 minutes before the start and talked to some folks I knew, including Steve from NP_NYC and my good friend Sam from high school. I ate my first of two gels and stood at the back of the A corral, which was fine by me: I start too quickly when at the very front. And then we were off! I crossed the start line 25 seconds after the horn. Runners jockeyed for position for the first quarter before spreading out. The Grand Concourse sloped slightly upward, and then rolled gently up and down for the first mile. I passed the mile 1 time marker at 6:30, logging a 6:05 pace. This felt very fast (I anticipated a 6:15 pace for this race), but I felt great and went with it. The next two miles contained additional rolling hills, with a steep uphill during mile 3 coming out of an underpass. I paced myself and ran easy on the uphill as other runners surged past me. I ran mile 2 in 6:12, and mile 3 in 6:20, putting me at about at 6:12 pace for the first three miles. I cruised down the final downhill off the Grand Concourse and into the first part of the north course loops feeling strong and focused. A number of spectators yelled “F*ck Yeah!” or “Let’s Go, NP!” when I ran by with my November Project #grassrootsgear, and I smiled and screamed “F*ck Yeah!” right back at them. Having never run for a team before, I loved every second of this. Around Mile 4 I sucked down my second gel, grabbed some water, and estimated my pace at about 6:15 minutes per mile. This seemed right to me, but I still felt strong as I paced off a runner clipping at faster than 6:15/mile. We pounded fists and fought through the flat loop. As we emerged from the loop, we ran alongside the next wave of runners. So many familiar faces and “NPs!” from Billy, Tricia, my sister, Ashley, and Sam, and maybe others I left out. I may have gotten a bit too exuberant with the high fives, but whatever! I was feeling it. The second loop at the top of the course found us east of the Grand Concourse on a pleasant tree-lined street. The out was a smooth downhill, and the in a steady uphill. I ran mile 5 in around 6:10, and mile 6 at a sub-6 pace. Mile 7, the smooth uphill, had me reconnecting with the Grand Concourse for the final push home at about a 6:10 pace. I danced a bit to the DJ music at the head of the Grand Concourse (where all the loops connected), and mentally prepared for the final three-mile push. The second I passed the mile 7 marker, I accelerated and focused on passing the next runner. At first this proved easy: A number of runners who had charged up the mile 7 incline were slowing down, so I overcame about ten runners before mile 8. Once mile 8 hit and the course became almost exclusively downhill, it was on. Every step became more difficult, but I kept my eyes focused ahead on the next runner, reeling him or her in to the rhythm of my breath in sync with my steps. The field had thinned a lot, so when I would pass a runner I would hear his footfalls for a few seconds, and then nothing but my own feet and breath. I passed the mile 9 marker in a net time of 54:35, which shocked me. If I could run a 5:25 final mile, I could break the one hour mark! I had not even considered this before the race, so I buckled down, grabbed some water, and pounded the pavement. As we approached the finish line, I heard cheers and saw lots of people gathered. No one was behind me. The runners in front of me were too far away to pass. I kept the pressure on myself and crossed the start line with an official time of 1:00:45, good enough for a net time of 1:00:20. Woot! I danced a bit to the awesome tunes of DJ Kool Herc, grabbed some official finisher’s photos with my finisher’s medal, slammed a bagel and apple down my throat, and reveled in the fact that I somehow ran a 6:02 pace, only six seconds off my BEST 5K PACE! I later learned that my sister ran a PR pace, which is amazing considering she never ran before two years ago, and only really started getting serious about it last year. She doesn’t believe me, but she is my inspiration for running. She stays consistent with her training plan, hits the NP_NYC workouts hard, and has shown such consistent improvement. Kate is great, and now you know! After a short rest, I gathered my belongings and ran about 5-6 miles home, crossing the Macombs Dam Bridge into Harlem, and then down through Harlem to Central Park. I didn’t clock these miles, but I imagine they were pushing 10 minutes each. My foam roller never felt so good! Post-race celebrations found my sister, my girlfriend, and I down in TriBeCa with my parents, aunt, and Mom’s cousins. That group ran the Tunnel to Towers 5k, which they’ve done every year for the past four years. The event honors Stephen Siller, a member of FDNY who died at Ground Zero after running from Brooklyn to the World Trade Center through the Brooklyn Battery Tunnel on September 11, 2001, in an effort to provide immediate assistance to the relief efforts. The run tracks the path he took on 9/11, and it’s just a really profound experience. The foundation created in his name also provides amazing benefits to wounded warriors. We ate a tasty brunch at Añejo, talked about our respective events, and smiled and laughed a lot. My legs felt surprisingly good, although my right hip was definitely more sore than the left (but not in a bad way). I was happy to get home afterward and chill on the couch, watching “Boyhood,” the Netflix DVD that my girlfriend and I have had on our TV table for about two months. In conclusion, I’ve said it before and I’ll say it again: I credit the Maffetone 180 Formula and training slow to race fast for my recent successes. I also credit NP_NYC and all their support. Also family, friends, and anyone who’s been reading this blog. It’s been a great journey, and I’m excited for the next couple of weeks of racing and all running beyond! Amazing race Jim! I’m just catching up on the entries now and getting the full story- you rock!